From the VHS age: An unusual retail release of LWT's THE PROFESSIONALS because it included an episode that was never shown on British 'terrestrial' telly. London Weekend became very nervous about the strong violent racist content in the episode and, after the edit was completed, decided not to screen it on ITV. Which is rather surprising as their drama department was bankrolling the show and must have had sign-off at every stage of the process... one wonders at which point someone piped up and said 'maybe not chaps'. That didn't stop them recouping some of their investment by including the episode when the show was sold overseas. It was also omitted from the run of episodes (which were often cut to make them suitable for pre-watershed slots) on GRANADA PLUS. Needless to say, it has also turned-up on the DVD and BR releases. 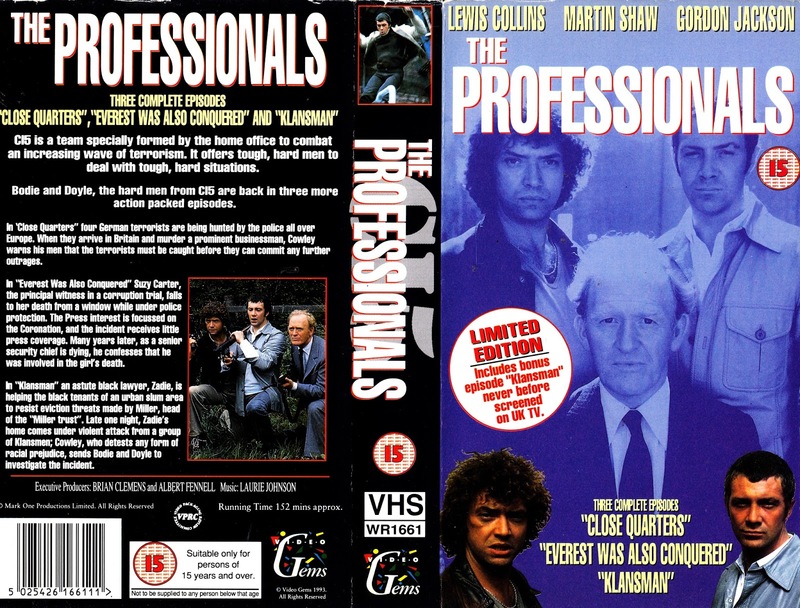 Repeats of the whole series have been few-and-far between on terrestrial TV (I recall seeing one episode as part of a season of reruns celebrating the 21st birthdays of Thames and LWT... although I think the celebrations were limited to the London region and the rest of the network carried an alternative schedule) allegedly because of a contractual wrangle between Martin Shaw and LWT. Its a bumper week for star wars comics. Not only is the first volume of newspaper strips out but also a new EPIC volume which collects the rarely seen strips from STAR WARS KIDS magazine. also out is the new issue of HORRORVILLE which has some nice articles on twin peaks and Alien. It's good to see the one true WW on the cover of the current issue of GEEKY MONKEY. I almost went for the STAR WARS NEWSPAPER STRIPS book until I spotted the MASTERS OF THE UNIVERSE 'ENCYCLOPEADIA' for the same price. Nice to see it covers all (I assume) of the various international versions of HE-MAN lore... including the Cannon movie. The new issue of CINEMA RETRO is out as well. I used to travel to BORDERS to get CINEMA RETRO but they went our of business and I haven't bought an issue for years.